There are a few things you can do to take care of your air conditioner and make its life a little longer and a little easier. How does your air conditioner work? Simply stated, an air conditioning unit removes heat from the air and blows it outside with an outdoor fan. 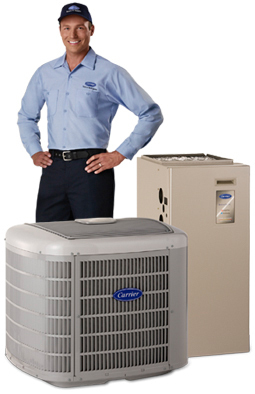 An indoor fan pulls room air across an evaporator coil filled with refrigerant and transfers cool air into your home. Obviously, the movement of air by fans is a big part of the system. That's why it is so important to replace the filter at least once a month. As dust is picked up, it is trapped on the filter, and you would be surprised how quickly the dust accumulates. Trying to pull air through a clogged filter just makes the fan work harder, raising your utility bill. The same is true for the fan in the outdoor unit. Make sure the outside of the unit is away from shrubs and other vegetation growth, and keep the unit as clean and free of leaves and dirt as possible. Provide at least five feet of clearance at the top and two feet on all sides of the unit. When using your air conditioning, the best method is to leave the temperature setting at one comfortable spot. The more you move the temperature up and down, the more work your system must do. If you must move the temperature setting, make the smallest movement possible. Another way to prolong the life of your air conditioning unit is to operate your other appliances wisely. Dishwashers, washers, dryers and stoves all generate heat and humidity indoors. Try to schedule laundry and cooking during the mornings or evenings to avoid taxing your air conditioner in the heat of the day. Use an exhaust fan in the kitchen, and vent your clothes dryer outside to give your air conditioner a hand. Sunshine is also an enemy of air conditioning. Keep drapes and shades pulled to prevent sunlight form streaming into rooms. Over 20 percent of your bill can be due to sunlight. Also, make sure the drain your condensation drips into is clear. Pour a cup of regular laundry bleach down the drain once a month to kill algae and mold and keep the drain running smoothly.